We couldn't be happier by keeping sisters from the same litter - Gracie & Annie together. They have very different personalities and bring so much joy to my husband and I; they're our 'first children'. They have quickly become part of our family! Comments for The perfect pair! Annie is black and white, with a shade of gray. You are right, it is a very uncommon color for the breed. Her sister Gracie is black and white, her two brother were completely white (one with a touch of champagne). Annie was the runt of the litter. We are happy we have her, as well as Gracie. Can you tell me what color/pattern Mellow Annie is? 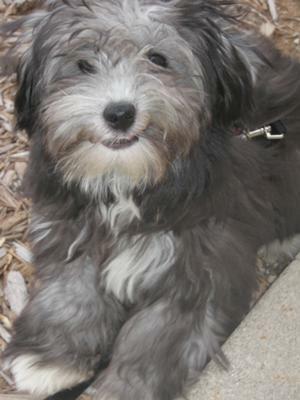 We just got a Coton puppy that I think is going to turn out with this color formation. It must not be a very common color for this breed, as I haven't seen but one or two in pictures on the internet. Thanks for your help! 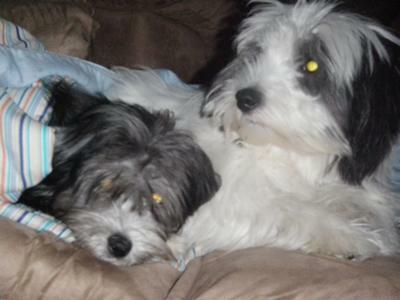 Hello everyone- Annie & Gracie were from a breeder near Northfield, MN who has had a litter a year for the past 7 years. They were born on March, 15, 2010. Neither girl has had any professional hair grooming, but my husband and I have made it a priority to brush them at least daily to help prevent the matting, and we've given them a few baths. We just use a little matte brush with tiny bristles, and lucky for us, they both don't mind being brushed (paws and all). Gracie got a home trim around her eyes done with a simple pair of shears, and Annie is getting to the point of needing one. We would love to keep their hair growing! That is the most adorable smile! Where do you get them groomed? I have only done it once and the groomer doesn't get it right. Dexi is getting really matted and I'm tempted to get him cut down -which makes me SO sad as our family loves his beautiful coat! Any suggestions? Where did you get your Coton babies? I am from Farmington, MN. 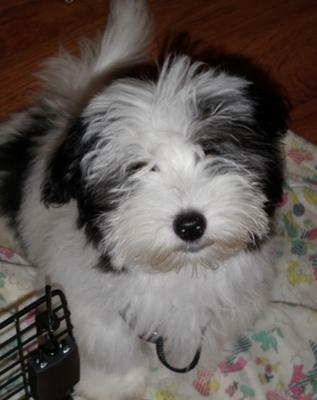 I adopted my Coton from a breeder in Castle Rock/Lakeville. Could my Dexter be a relative? He's gray and white, too. they are so adorable !!!! Oh how sweet. Annie and Gracie are adorable. Funny how they can look so different coming from the same litter. Thanks so much for sharing!